"The book focuses on data-driven modeling and design processes, and it provides a context for extending traditional linear model thinking to generalised linear mixed modeling. This is a very sound text which teachers of any course on GLMMs should consider adopting." "Walter Stroup is a leading authority on GLMMs for applied statisticians, especially as implemented in the SAS programming environment. He offers a thorough, engaging, and opinionated treatment of the subject ... I found the ‘fully general’ GLMM approach to modeling and design issues (Chapters 1 and 2) to be quite illuminating. ... it is best to use this text in conjunction with SAS. Prospective readers without current access to SAS will be pleased to know that a reasonable level of access to SAS is now available at no cost to students and teachers on the web ... If the reader prefers to work with GLMMs in the free, powerful, and state-of-the-art R environment, then he/she should supplement this text with some others that are built around R. I myself had good luck using Stroup’s text along with Julian Faraway’s two books Linear Models with R and Expanding the Linear Model with R, both published by CRC Press." "... for SAS users concerned with the analysis of trials, it is a very good resource. There are excellent discussions on many important concepts such as likelihood ratio testing and model selection criteria. PROC GLIMMIX is a powerful procedure implementing the rich family of GLMMs, and this book gives coverage to a wide variety of models with ample software illustration." 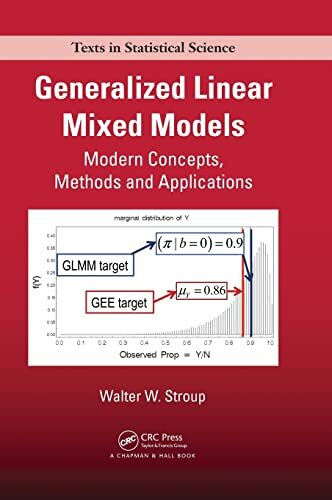 Generalized Linear Mixed Models: Modern Concepts, Methods and Applications presents an introduction to linear modeling using the generalized linear mixed model (GLMM) as an overarching conceptual framework. For readers new to linear models, the book helps them see the big picture. It shows how linear models fit with the rest of the core statistics curriculum and points out the major issues that statistical modelers must consider. Along with describing common applications of GLMMs, the text introduces the essential theory and main methodology associated with linear models that accommodate random model effects and non-Gaussian data. Unlike traditional linear model textbooks that focus on normally distributed data, this one adopts a generalized mixed model approach throughout: data for linear modeling need not be normally distributed and effects may be fixed or random. With numerous examples using SAS® PROC GLIMMIX, this book is ideal for graduate students in statistics, statistics professionals seeking to update their knowledge, and researchers new to the generalized linear model thought process. It focuses on data-driven processes and provides context for extending traditional linear model thinking to generalized linear mixed modeling. See Professor Stroup discuss the book.